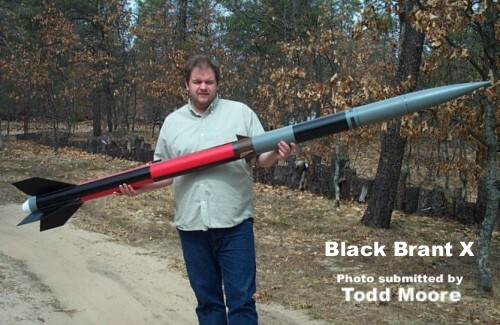 A very large (over 8-1/2 feet tall) model of the sustainer stage of Canada`s Black Brant 10 sounding rocket. Complete with "Kwik-Switch" motor mount, 0.093 G-10 lower fins, 0.062 canard fins, and tailcone! Plenty of room for a large payload too. Weighs approximately 107 oz. and flies on H through J motors. CP: 77" from the nose tip. You may need to adjust CG and either friction-fit your motor or use the retainer. Epoxy can cause an allergic reaction in some people. Adult supervision and wearing rubber gloves is recommended when working with epoxy.